Samidoun Palestinian Prisoner Solidarity Network strongly condemns the detention of Hisham Ghalia and Mounis Hammouda in U.S. migrant detention and urges all to participate in the below action. Click here to take action. 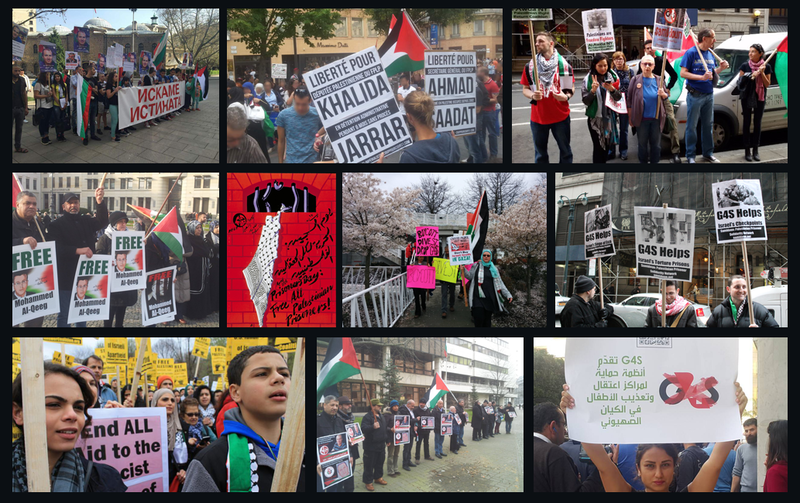 Of course, the issue of migrant detention is not confined to the cases of Palestinian refugees; we join in the call for an immediate end to migrant detention – often indefinite – by U.S., Canada, Australia and other states. The detention of migrants and refugees is a violent act of criminalization that traumatizes traumatized people, tears apart families and subjects people to massive rights violations, in a context of racism and oppression. We also note the settler colonial nature of all of these states, built on the theft of Indigenous and Native land and genocide of Indigenous and Native people, while constructing detention centers to exclude migrants and refugees from this stolen land. We also note the racist migrant detention, attacks and criminalization by the Israeli state and institutions targeting African migrants and refugees, a vicious and anti-Black policy carried out by a settler colonial state based entirely on the dispossession of the Palestinian people, the theft of Palestinian land, and ongoing genocide. These states are also responsible for creating the conditions that force people to migrate, through economic exploitation and plunder, neo-colonialism, and imperialist war, aggression and militarization, and then criminalize the victims of their actions. We also stand in solidarity with the hunger striking women held in Hutto Detention Center in migrant detention in Texas and join the demand for their immediate release; we also demand the immediate release of all people held in migrant detention and uphold the right of all to move, to stay and to return. Two Palestinian refugees who have been determined to have “credible fear” if deported face indefinite detention. One of them could be deported at any time, the other remains in limbo.In 2010 and 2011, Hisham Shaban Ghalia and Mounis Hammouda fled continued violence and poverty in Gaza–part of the Israeli-occupied Palestinian territories in the Southeastern Mediterranean. Over that time, both men migrated undocumented through at least eight countries between the Middle East, Europe, as well as South and Central America before arriving at the US-Mexico border to request humanitarian asylum in November 2014. An October 2015 article in UK Guardian has documented their part of a large wave of Middle East and African refugees/migrants moving through Mexico since 2011. Since Hisham and Mounis’s arrival at the US-Mexico border one year ago, they have been detained in Florence, Arizona. Even though both men were determined to have “credible fear,” the first step in claiming humanitarian protection from persecution, they are still being held in indefinite detention. Immigration authorities have denied Hisham’s asylum claim and have issued a final order of removal, but are unable to deport him due to restrictions that prevent US immigration authorities from dealing directly with the Palestinian authorities. Therefore, although both men meet “low priority” criteria under the Department of Homeland Security’s own standards, they remain in limbo, and subject to indefinite detention. Both men potentially face further imprisonment or death if deported to Israel or Saudi Arabia, where Hisham was born to a Palestinian refugee family but lacks citizenship or residency, Currently an anti-occupation uprising is searing the West Bank and Gaza, where between Oct. 1-Nov. 8 alone Israeli police and military have killed at least 79 Palestinians and injured more than 3000.